Production support team wants to know out of 76000 application error messages (mainly sync faults) occurred yesterday what are the error code or description and how many of them are repeating to which interface, business system & application name within SAP CRM for ex. They want to know error descriptions, their number, service & operation Names, so that they can prioritize which one to pick up first & also to track most common/ repeating error codes coming in last 1 month. Cost of logging synchronous logging in PRODUCTION environment is very high, especially when response times really matter so we generally prefer to turn off logging for synch messages in PI & ABAP. By default, PI & ABAP logs errors messages for synchronous. But when it comes to Faults messages, these are handled slightly differently, PI treats Application faults as success hence not logged, whereas ABAP logs application errors coming using Fault structures. Proxy framework looks specifically value of messageclass, if value is ApplicationError then treats message as Application Error. As message is logged in ABAP stack, no choice but can use sxmb_moni to see what it is and take action but trouble starts when there are few hundreds or thousands fault messages returned back to ABAP stack? or write custom solutions to extract what we need from standard tables. Step 2: From SXMSPEMAS for interface names. Step 3: From SXMSPERROR for error details. Step 4: Finally open payload if needed to check fault message structures from cluster tables sxmsclur and sxmxclup. Scenario: Suppose you have 4000 faults messages and you run 40 synchronous interfaces, called by 4 different applications/programs. Step1: I want to simply know different fault error description or codes and number of interfaces having same error, after this information I then decide to see payload. Step2: Group them by application wise or program name wise who has called etc.……. End of the day, I simply want to get fault message overview based on ApplicationID + Fault Codes + Error Description, similar to message overview but top hierarchy should be error code or descriptions or any other parameter that customer wants. Customer landscape has 20+ million synchronous calls from SAP CRM to various legacy systems via 3 PI systems, daily we might have few thousands fault messages, this could be various reasons, incorrect data, something wrong in legacy side which is returned as application faults….etc. out of all application errors, group based on error codes, error descriptions (these values are present in each fault structures) of faults and how many of them are from which applicationID’s so that priority can be given based on type of errors. Out of all the tables in SAP ABAP stack related to sxmb_moni, table SXMSPERROR is life savior, this tables turns out to be key in simplifying things. Let’s run below statement from SXMSPERROR table. There is another field which is THE PLACE to hold what we need is “ERRTXT”. SXMSPERROR is life savior only when we use it in proper way. Before using it in proper way, let’s see how it works by default. Below is the picture of normal fault message which might look like below one, the field values are mapped to sxmxperror table fields to get idea how this is linked. Question is what influences values of these 3 fields, how does the text “Applications errors have orrcured” appeared in AdditionalText? Why not some other text? Lets take step back into PI and recollect Fault structures. Reason is faultsCode and FaultString when genereated by webservice host, this should be sent unaltered to clients, there is no logical reason to change this. If webservice host sends FaultString in SOAP fault body, this field value will gointo AdditonalText field (sxmxperror-errtxt field), if faultstring is empty then “Application errors have occurred” text is inserted by Proxy frame work. Since in this case SOAP 1.1/1.2 fault message is converted to XI 3.0 message format, we have bit control to overwrite AdditionalText field which gets stored into ERRTEXT CLOB field in table SXMXPERROR. Above 3 fields could be used based on specific requirements, this gives developers lot of flexibility in getting basic information out without opening payloads, once we have this certainly we can open payload if you want to investigate further. SAP PI changes to make overwrite information in SXMXPERROR table fields. 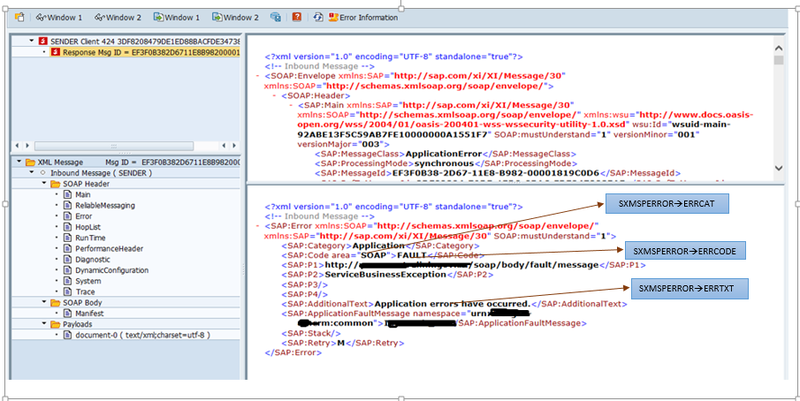 We need an adapter module which will update structure called <sap:Error></sap:Error> in XI3.0 message format. I am just pasting the relevant part of the code in adapter module. InterfaceName, operationName & errorText you can get it either from payload or put in some dynamic configuration from fault mappings……. Currently, the way I have implemented is that, all required values for ERRTXT field is extracted using dynamic configuration variable, these variables are created from fault mappings. String appID = "Get it from fault mappings or dynamic configurations variables"
This option gives us lot of flexibility to get error information’s we need, down side is its quite a change for interfaces which are already running in production which doesn’t have fault messages defined, might be for new ones we can follow this approach……., we definitely need flexibility to not only track error but track in the way we want to based on organization needs, said that there could be other better ways to do it so any comments or criticism is most welcome. Nice! Always love new ways to find the bugs that hide very well from me.